All simulation methods were written from scratch and are executed in parallel in several GPU fragment shaders for fast performance. Built by Amanda Ghassaei as a final project for Geometric Folding Algorithms. Code available on Github. If you have interesting crease patterns that would make good demo files, please send them to me (Amanda) so I can add them to the Examples menu. My email address is on my website. Thanks! Slide the Fold Percent slider to control the degree of folding of the pattern (100% is fully folded, 0% is unfolded, and -100% is fully folded with the opposite mountain/valley assignments). Drag to rotate the model, scroll to zoom. Import other patterns under the Examples menu. Upload your own crease patterns in SVG or FOLD formats, following these instructions. Export FOLD files or 3D models ( STL or OBJ ) of the folded state of your design ( File > Save Simulation as... ). 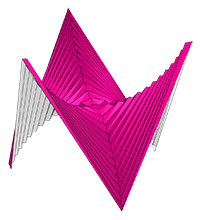 Visualize the internal strain of the origami as it folds using the Strain Visualization in the left menu of the Advanced Options. If you are working from a computer connected to a VR headset and hand controllers, follow these instructions to use this app in an interactive virtual reality mode. More documentation about the simulation methods in this paper. Additional info can also be found here. Load more origami patterns here! Bad design files will throw errors and create models that explode or cannot be solved, here are some tips for importing FOLD or SVG files that work. You may specify the target fold angle of each crease using the edges_foldAngles field. Note that fold angle is a number in degrees lying in the range [−180, 180]. The fold angle is positive for valley folds, negative for mountain folds, and zero for flat, unassigned, and border folds. Accordingly, the sign of edges_foldAngle should match edges_assignment if both are specified. If you are unsure whether your FOLD file is valid, you can inspect it using the FOLD Viewer. If you are having trouble, please refer to the FOLD spec. Boundary edges have black stroke - rgb(0, 0, 0), hex #000000 - use this edge type for both the outline of the pattern, and any internal holes. Before the model can enter the simulator, this tool will automatically triangulate regions in the pattern that form polygons with more than three sides. To control the triangulations, draw lines in yellow - rgb(255, 255, 0), hex #ffff00. In general, patterns are more stable when their triangulation is symmetric and minimizes long, skinny triangles. You can see how the app automatically triangulated your pattern by enabling "Facet Crease" visibility in the Advanced Options > Edges Visibility menu on the left side of the screen. It may not be necessary to add triangulation lines on your pattern. Facet creases (yellow triangulation lines) are creases that try to remain flat (0° fold angle) as the pattern folds, but some compliance in the constraints of the simulation will allow them to bend slightly. Drawing in facet creases allows you to control the way the model bends in between mountain/valley folds. This is especially relevant in patterns with curved creases. Cuts have green stroke - rgb(0, 255, 0), hex #00ff00 - use this edge type to form thin slits in the pattern. Undriven creases have magenta stroke - rgb(255, 0, 255), hex #ff00ff - creases of this type will swing freely. Use this crease type when you're not sure what angle some of the creases in your pattern should fold to. Line style and stroke width do not matter. Remove clipping masks from your file before importing. This tool should be able to automatically clean files of slightly misaligned vertices, stray vertices, duplicate lines, and extra vertices falling in the middle of an edge, but it is recommended to remove these errors yourself in order to avoid problems. If your simulation is not working, check that the imported pattern looks correct by clicking on the Pattern view in the top nav bar. You can also download a copy of the imported pattern ( File > Save Pattern as SVG ) and view it in a vector editing program of your choice. I use Illustrator to create SVGs (though any vector editing program should be fine). Here are some tips I've found for making svgs to import into this tool. If you are starting with a pre-made vector file, first release all clipping masks (Select all + Object > Clipping Mask > Release). Create geometry using the Line Segment, Rectangle, and Polygon tools. 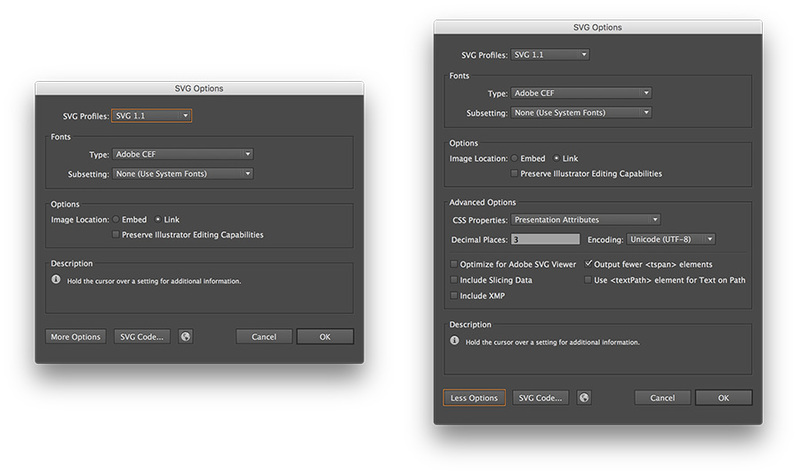 Illustrator can help you select all lines of a particular type so that you can edit their color or opacity together. Click the line, then go to Select > Same > Appearance to select all similar lines in the pattern. Be sure that CSS Properties is set to Presentation Attributes in the Advanced options. Finally hit Save As and select .svg extension. I'm using the default SVG 1.1 settings, but version 1.0 will work as well. This tool currently supports an interactive Virtual Reality mode for the Vive and Oculus headset and controllers (it may work on others, but it is not tested). For this to work, you must first use a WebVR enabled browser: currently only an experimental build of Chromium (with enable-webvr and -enable-gamepad-extensions flags) and the latest Firefox for Windows are supported by this app. When you open this page with the appropriate browser, you will see a button that says "ENTER VR". Clicking this will put the app into an interactive VR mode. The hand controllers will allow you to grab the origami mesh and pull on it. This is especially interesting if you set the Mesh Material to Strain Visualization so you can see how your interactions change the internal strains in the material. If the simulation looks choppy, consider lowering the Animation Settings > Num Steps Per Frame setting. The origami should load up in the center of your playspace. If things load way off in the distance, you may need to reboot your headset and controllers and refresh this app. I do this through SteamVR. If you hand controllers are not appearing, try clicking the System Button (Vive) to get them to wake up. If you still have trouble connecting, try refreshing this app. WebVR is changing rapidly, if you cannot connect be sure you have the latest browser version and install any firmware updates on your headset, controllers, and sensors. The dynamic simulation is calculated by solving for all the forces in the system, moving time forward in small Δt steps, and updating the vertices of the origami incrementally. The time step size for this animation is calculated automatically based on the material stiffnesses set in the Simulation Settings section: more stiff settings require shorter time steps to solve and will slow down the simulation. Num simulation steps per frame allows you to control the number of tiny time steps forward to take on each render cycle. If the simulation looks choppy to you, you might consider lowering this setting. Lowering the number of steps per frame will slow down the simulation, but will result in a more smooth animation. Save with triangulated faces Save with vertices_foldAngles For more information about the FOLD file format, see the offical docs. Use the FOLD viewer to check that your file has been exported correctly. Average vertex error gives a sense of how much the distance constraints in the origami pattern are being violated (i.e. how much the sheet is being stretched). The error at each vertex is evaluated by averaging the percent deviation of all its distance constraints with adjacent vertices. 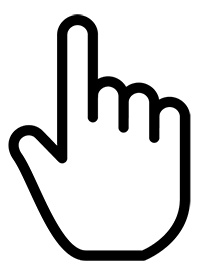 This error is reported as a percent of the total length of the distance constraint to remove scaling effects. This measurement is equivalent to Cauchy strain or engineering strain of the distance constraints on this system. Increasing the Axial Stiffness will tighten these constraints and lower the error in the simulation. To visualize the error of each vertex graphically, select Strain Visualization under Mesh Material in the left menu. This app uses a compliant dynamic simulation method to solve for the geometry of an origami pattern at a given fold angle. The simulation sets up several types of constraints: distance constraints prevent the sheet from stretching or compressing, face constraints prevent the sheet from shearing, and angular constraints fold or flatten the sheet. Each of these constraints is weighted by a stiffness - the stiffer the constraint, the better it is enforced in the simulation. Axial Stiffness is the stiffness of the distance constraints. Increasing axial stiffness will decrease the stretching/compression (strain) in the simulation, but it will also slow down the solver. Face Stiffness is the stiffness of the face constraints, which help the axial constraints prevent deformation of the sheet's surface between the creases. Fold and facet stiffnesses correspond to two types of angular constraints. Fold Stiffness is the stiffness of the mountain and valley creases in the origami pattern. Facet Stiffness is the stiffness of the triangulated faces between creases in the pattern. Increasing facet stiffness causes the faces between creases to stay very flat as the origami is folded. As facet stiffness becomes very high, this simulation approaches a rigid origami simulation, and models the behavior of a rigid material (such as metal) when folded. Internally, constraint stiffnesses are scaled by the length of the edge associated with that constraint to determine its geometric stiffness. For Axial constaints, stiffness is divided by length and for angular constraints, stiffness is multiplied by length. Since this is a dynamic simulation, vertices of the origami move with some notion of acceleration and velocity. In order to keep the system stable and help it converge to a static solution, damping is applied to slow the motion of the vertices. The Damping slider allows you to control the amount of damping present in the simulation. Decreasing damping makes the simulation more "springy". It may be useful to temporarily turn down damping to help the simulation more quickly converge towards its static solution - especially for patterns that take a long time to curl. A Numerical Integration technique is used to integrate acceleration into velocity and position for each time step of the simulation. Different integration techniques have different associated computational cost, error, and stability. This app allows you to choose between two different integration techniques: Euler Integration is the simplest type of numerical integration (first order) with large associated error, and Verlet Integration is a second order integration technique with lower error and better stability than Euler. Cauchy strain or engineering strain is a unitless measurement of how much a material is being stretched or compressed under load. 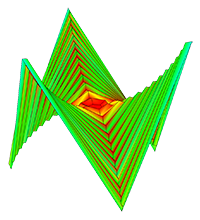 The Strain Visualization illustrates the strain across an origami sheet by mapping it to a color from blue (no strain) to red (max strain). Toggle this control to enable/disable mouse interaction with the origami model. When enabled, mousing over the model will display a highlighter; clicking and dragging allows you to interact with the model in real time. 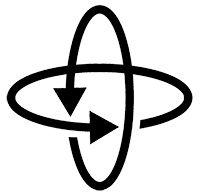 Very vigorous interactions with the model may cause it to pop into a strange configuration that it can't escape - use the Reset button to start the simulation again from a flat state. Hex colors are 6 digit alphanumeric codes that specify different colors. You can get these codes using a color picker. Vertices within this px tolerance in the SVG will be merged into one. It is recommended to keep this number above zero. Having trouble? See these SVG Import Tips. This app uses GPU functions that are not supported by this device/browser, please try again on desktop with Chrome/Firefox. This file was generated by Maze Folder, an app by Erik Demaine, Martin Demaine, and Jason Ku that creates crease patterns for any raised maze on a square grid. Based on the paper Folding Any Orthogonal Maze by the same authors. Designed by David Huffman. Crease pattern adapted from the paper Reconstructing David Huffman's Origami Tessellations. Designed by David Huffman. More info about Huffman's curved crease folding can be found in the paper Reconstructing David Huffman’s Legacy in Curved-Crease Folding and the thesis Computational design with curved creases : David Huffman's approach to paperfolding. Designed by Robert Lang. All original crease patterns can be found on Lang's website. Designed by Robert Lang using Treemaker. More info about Lang's Treemaker software can be found in the Treemaker Manual or in the book Origami Design Secrets. All original crease patterns can be found on Lang's website. Move Fold Percent slowly for this pattern to fold correctly! When this pattern is triangulated (during the setup of the simulation) it forms many skinny triangles, these triangles are very unstable as the pattern folds. Alternating asymmetric triangulation of hypar from (Non)existence of Pleated Folds: How Paper Folds Between Creases. Comparison of square twist bistability, inspired by the paper Origami structures with a critical transition to bistability arising from hidden degrees of freedom. 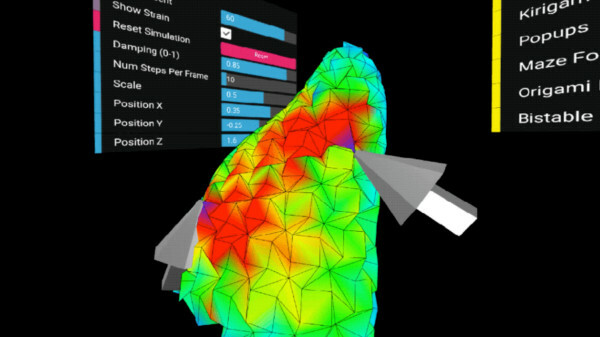 Switch to strain visualization to compare patterns. Designed by Elod Beregszaszi, original patterns available at Popupology. Designed by Ullagami, original pattern available at Ullagami. Designed by Tomoko Fuse. Crease pattern by Sara Adams - video of the design process on YouTube. Designed by Yoshinobu Miyamoto. Crease pattern from Happy Folding. This file was generated by Polygami, an app by Shahul Alam, Lauren Huang, and Mahi Shafiullah that creates crease patterns for any 2D arrangement of voxels on a square grid. Allow this pattern to fold, then select Allow User Interaction (Advanced Options right menu) and drag the central vertex to pop into into an alternate, inverted configuration. Original design by Emmanuel Mooser. Crease pattern corrected and modified for rigid origami by William Gardner. Based on Flower Tower design by Chris K. Palmer. Crease pattern files generated by William Gardner. Increasing scale allows you to record at higher than screen resolution. Resize browser window to change aspect ratio. Notes: This feature captures the output of the canvas only - no UI or cursor will be included. Do not resize window while recording. You can increase the amount of motion per frame by increasing the "Num simulation steps per frame". Check the View menu (above) for more rendering options.